Sipping my daily dose of Ice Water and nibbling on my half eaten power bar, I started to give way to the one-way conversation Discouragement was pitching. "What if you're wasting your time and your money, you can't let your life pass by doing this for people who don't even care! You're not the only one trying to be heard; you'll probably never be rewarded for your hard work, just give it up!" These were the thoughts intruding my mind as I let Discouragement chat up a storm inside of my spirit. I had two choices at this point. One, I could agree with Discouragement and all his buddies- which would allow his cloak of low self esteem to strangle me into a place of fear and eventually defeat...Or two, I could muster up enough strength to fight Discouragement by clinging onto faith (which we can't see)- and loves to take us to unknown territories with no map! So feeling a stream of boldness starting to bubble up within me, I began to speak every scripture I could think of to do battle with this enemy that wanted to steal my very life from me! Psalm 42:5 Why, my soul, are you downcast? Why so disturbed within me? Put your hope in God, for I will yet praise him, my Savior and my God. 2 Corinthians 5:7 For we walk by faith, not by sight,"
1 Peter 4:10 "Each of you should use whatever gift you have received to serve others, as faithful stewards of God’s grace in its various forms." Jeremiah 29:11 "For I know the plans I have for you,” declares the Lord, “plans to prosper you and not to harm you, plans to give you hope and a future. " Epehsians 6:10-17 10 Finally, be strong in the Lord and in his mighty power. 11 Put on the full armor of God, so that you can take your stand against the devil’s schemes. 12 For our struggle is not against flesh and blood, but against the rulers, against the authorities, against the powers of this dark world and against the spiritual forces of evil in the heavenly realms. 13 Therefore put on the full armor of God, so that when the day of evil comes, you may be able to stand your ground, and after you have done everything, to stand. 14 Stand firm then, with the belt of truth buckled around your waist, with the breastplate of righteousness in place,15 and with your feet fitted with the readiness that comes from the gospel of peace. 16 In addition to all this, take up the shield of faith, with which you can extinguish all the flaming arrows of the evil one. 17 Take the helmet of salvation and the sword of the Spirit,which is the word of God. --And then in happened! That cloak of heaviness was torn from me as I began to praise the Lord for His goodness, His faithfulness, and His everlasting Love with the power of my sword (my scriptures)...All I could do was bask in the presence of God's grace sustaining me in that moment. I felt secure and I knew that my battle in that car with Discouragement was over because I put up my shield of faith even though I couldn't see the outcome to my questions and situations. I took out my sword and slew my enemies because the word of God is power in the mouths of a believer with faith! I stood my ground on God's promises and planted my feet! God delivered strength to me once again so I could face another day of mystery. As long as he's with me, nothing can stand against me. So my friends, why am I telling you this? I aim to encourage you to today to stand up and fight against Discouragement and his whole entourage! Use your sword and fight those spirits of fear, jealousy, anger, hatred, low self esteem, selfishness, greed, laziness, lack of self control, unforgiveness, bitterness, lust, sickness, and everything else that would come against you! Don't allow these spirits to control your thoughts, actions, or emotions. I know it is not easy when you don't have the answers to the problems your facing, and it seems like a great idea to give in at the time of exhaustion, but keep fighting. Don't give up. Don't let these liars come and steal your joy, your peace, or your future. And remember this-- if you are in a situation that seems like people are your enemies- I assure you they are not---better yet, God assures you they are not in Eph 6. Our battle is never against flesh and blood, but against spirits working through people. So today is the day to start fighting back the right way! Praying, praising, and proclaiming the word of God over our situations, families, and futures! It is the wisest strategy you can possibly play! P.S. Want to be encouraged today? 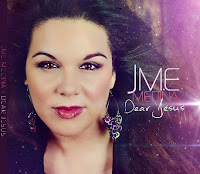 If you haven't bought a copy of my new CD "Dear Jesus", get one to play in the house, the car, or anywhere! Let it inspire you, encourage you, and feed strength into your spirit! 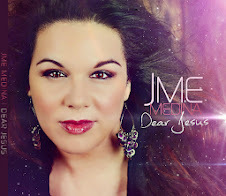 Subscribe To Jme Medina's Blog! I'm a hard working wife, mother, Christian Artist/Performer/songwriter, worship leader. I love without consequence, I believe as though I were a child, I look for the best in all situations, and I have faith that I'm exactly where I'm supposed to be wherever I am...because I know that God has mapped my every second of everyday. I choose to be a lover, peacemaker, and servant at heart. I want to be excellent at what I do, so I tend to be a perfectionist...although I'm so far from perfect and quite honestly have insecurities too shameful to name..lol. I give mercy, forgiveness, and grace the way I know God pours it out on me...I want my life to be worth something when I die, and the only way that can happen is if I give everything I have to Jesus and let him do what he will through my life. I want to be closer to him each day, and hope that my life blesses those around me.